North Korea has called itself a "utopia" and a "flower garden of human love" as it rejected US criticism of human rights violations as an attempt to topple the communist regime. A North Korean human rights association made the claim in an open series of questions to the US and the United Nations, claiming that US pressure over human rights is equivalent to "an act of political terrorism" against the country. "Does the US not want to get over with the old conventions, prejudices and hostile ideas even now when the Singapore North Korea-US joint summit agreement has been declared?" the association asked in the Korean-language questionnaire carried by the Korean Central News Agency. It also claimed that the US is raising the issue of human rights in the North in order to "wipe out the most superior place for the people in the world and the utopia envied by humankind by toppling our socialist system." The series of questions also portrayed the North as a country where all "political and democratic freedoms" are guaranteed, no one is jobless and all people are provided with free education, free medical services and free housing from the state. "Point out if there is a flower garden of human love like our republic on the planet," it said. The series of questions is the latest in a number of criticisms the North has made in recent weeks. 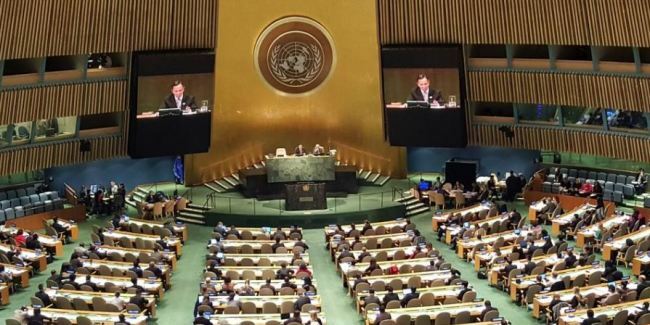 Earlier this month, the UN passed a resolution on North Korea's human rights situation, calling for accountability for gross human rights violations in the communist nation. It marked the 14th consecutive year the global body has passed such a document. The North's association blasted the UN for being a "puppet of the American empire." Last week, a North Korean propaganda outlet, Uriminzokkiri, also called on the US for mutual respect, saying its pressure on Pyongyang over human rights issues is going to extremes. The series of articles appears to amount to a call from the North for Washington to change its stance ahead of the expected second summit between US President Donald Trump and North Korean leader Kim Jong-un early next year. The two countries held a historic summit in Singapore in June, but their denuclearization talks have been stalemated over Pyongyang's demand for sanctions relief and Washington's insistence on keeping sanctions in place until the North's denuclearization. North Korea has long been labeled as one of the world's worst human rights violators. The communist regime does not tolerate dissent, holds hundreds of thousands of people in political prison camps and tightly controls the flow of outside information.